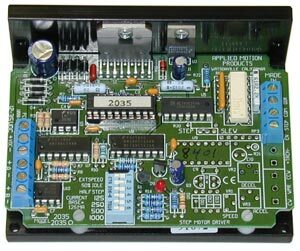 The 2035 step motor drive is a full or half step drive for use with 2-phase stepper motors. The 2035 utilizes three-state switching amplifiers and opto-isolated input circuits. The 2035 also includes an automatic idle current reduction feature that lowers motor current by 50% anytime the motor is left at rest for more than one second. This feature can be disabled. The 2035 amplifier regulates motor current by chopping at a constant, inaudible frequency. Phase current is selected from 16 levels by a DIP switch. Full or half resolution is also switch selectable.